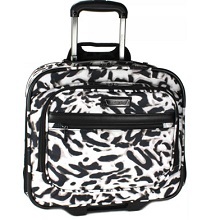 This exotic Snow Leopard print bag from Kenneth Cole is a great overnighter, the perfect travel companion. Durable and stylish 900D x 600D Poly Animal Print exterior treated with Micro-Guard tenchnology which provides superior resistance against water and outdoor elements. Double gusset construction with roomy, fully lined interior. Front exterior features an easy access full length zipper pocket and a gusseted zipper pocket for additional carry capacity. Front compartment has a full length zippered wet pocket, two elastic open top pockets, and one quart size “Flight friendly” toiletry top zip bag for carry-on.